This is a day I had been dreaming of for a while. 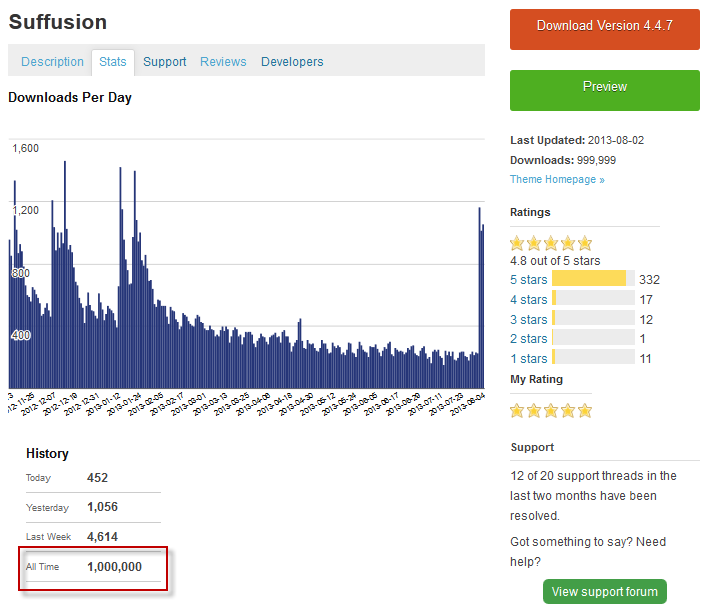 Eventually a few minutes past 7:30AM Central Time today, Suffusion hit a lifetime download mark of 1,000,000. Yup. One million downloads. Thanks to all of you for helping Suffusion get so far, right about the time of its fourth birthday! I also wanted to provide a quick update – I fixed an issue in the Suffusion Shortcodes plugin that was preventing the plugin from accepting more than 5 ad-hoc widget areas. Release 1.03 of the plugin should work fine. Suffusion is now a part of a very unique club with over 1 million downloads. Happy birthday to Suffusion and Many congratulations on an IMPORTANT Milestone. It has been a pleasure and privalage to work with Suffusion for the past three years and I look forward to many more wonderful years. I hope you get some time to celebrate in style. Congratulations, well-deserved ! And a Happy Birthday too ! Congratulations, and thank you! I’ve passed the word along to some of our people who use webs running Suffusion. Congratulation! AND thank you for your work at all. Congratulations. You and your hard work deserve this affirmation. I appreciate the theme and the work you have put in to it. Suffusion is a great theme to work with, and I definitely enjoy using it. Many congratulations on this mile stone and a superb theme. Thank you so much for all your hard work. Bravo! BRAVO! So well deserved. And now on to a billion, please. Congratulations! Well deserved. It’s an awesome theme and should come pre-installed as the WordPress default theme haha! Still using it on my website http://technouz.com because it’s just soo flexible and adapts to growth & my needs perfectly! i couldn’t survive without your awesome theme, and i’m enjoying learning css around configuring it in all kinds of odd ways it was never meant to be used in…… HAPPY BIRTHDAY!!!!!! Congratulations on this mile stone and a absolutely superb theme. Thank you all for the brilliant support and an excellent product. Some commercial companies could learn something from you guys! Congratulations, Sayontan! You’ve done amazing work with this theme. I know nothing about coding and yet I can have a great looking website- genius! I’m on my second webpage. This time I am devoting it to parents and children. My first webpage brought me in over 266,000 visitors. I have found Suffusion so easy to use. Now I’m opening my new webpage Install Complete! And publishing ebooks that have won awards. With the dawn of ebooks I can take my self published stories to your webpage. Thank you and congratulations, genius.